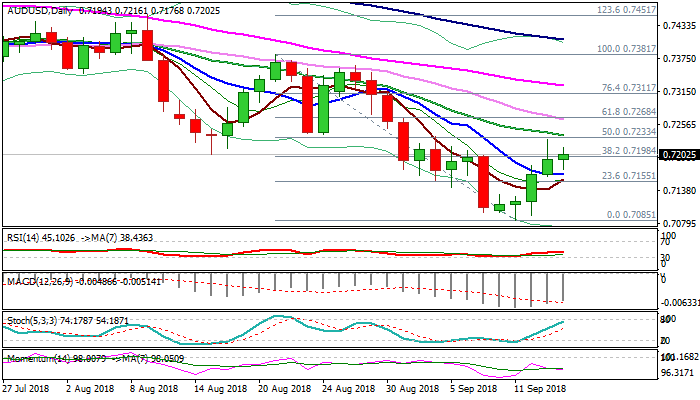 The Aussie dollar remains steady on Friday and probes again above 0.72 pivotal barrier after spike to 0.7229 on Thursday. Fresh positive sentiment was boosted by solid Chinese IP and retail sales data, with improving near-term outlook on stronger momentum studies and action being underpinned by rising and thickening hourly cloud. Bulls need a confirmation on close above cracked 0.7198 barrier (Fibo 38.2% of 0.7381/0.7085 descend), which would open way for extension of recovery leg from 0.7085 low towards barriers at 0.7237 (falling 20SMA) and 0.7265 (falling 30SMA). Reversal scenario is supported by long bullish candle on weekly chart, which is forming bullish engulfing pattern.